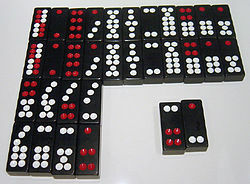 A set of Chinese dominoes. The top double-row of tiles lists the eleven matching pairs, in descending value from left to right. 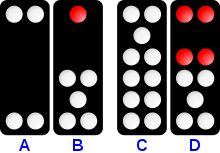 Below them are five non-matching pairs, worth less than the matching pairs, and also in descending value from left to right. The Gee Joon tiles, lower right, are the highest pair of all. Pai gow (Chinese: 牌九; pinyin: pái jiǔ; jyutping: paai4 gau2) is a Chinese gambling game, played with a set of 32 Chinese dominoes. It is played openly in major casinos in China (including Macau); the United States (including Las Vegas, Nevada; Reno, Nevada; Connecticut; Atlantic City, New Jersey; Pennsylvania; and cardrooms in California); Canada (including Edmonton, Alberta and Calgary, Alberta); Australia; and, New Zealand. It dates back to at least the Song dynasty. The name "pai gow" is sometimes used to refer to a card game called pai gow poker (or “double-hand poker”), which is loosely based on pai gow. Pai gow loosely translates to "make nine" and was the basis for Baccarat. There are 35,960 four-tile combinations possible. Tiles are randomized on the table and are stacked into eight stacks of four tiles each in an assembly known as the woodpile. Various ritualistic "shuffles" are made, rearranging the tiles in the woodpile in standard ways that result in a new woodpile. Bets are then made. Next, each player (including the dealer) are given four tiles with which to make two hands of two tiles each. The hand with the lower value is called the front hand, and the hand with the higher value is called the rear hand. If a player's front hand beats the dealer's front hand, and the player's rear hand beats the dealer's rear hand, then that player wins the bet. If a player's front and rear hands both lose to the dealer's respective hands, the player loses the bet. If one hand wins and the other loses, the player is said to push, and gets back only the money he or she bet. Generally seven players will play, and each player's hands are compared only against the dealer's hands. The name "pai gow" is loosely translated as "make nine" or "card nine". This reflects the fact that, with a few high-scoring exceptions, the best a hand can score is nine. To find the value of a hand, simply add the total number of pips on the two tiles, and drop the tens place. So for instance, a 1-3 tile (a tile with one pip on one end and three pips on the other, for a total of four pips) used with a 2-3 tile (with five total pips) will score nine, since four plus five is nine. A 2-3 tile with a 5-6 tile will score six, and not sixteen, as the "1" in "16" is dropped. And a 5-5 tile with a 4-6 tile will score zero, since ten plus ten is twenty, and twenty reduces to zero when the tens place is dropped. The 1-2 and the 2-4 tiles are called Gee Joon tiles (or sometimes called wildcards). Either tile can count as 3 or 6, whichever scores more. So a 1-2 tile can be used with a 5-6 tile to make a hand worth seven points, rather than four. The matching pair of eights (left) is worth more than the non-matching pair of eights (right). If a hand contained one of the tiles on the left and one of the tiles on the right, these would not form a pair at all, since the tiles that make pairs are defined by tradition. When two pairs are compared, the higher-valued pair wins. This is not determined by the sum of their pips, but by aesthetics. It must be memorized which pairs score more than other pairs. The highest pairs are the Gee Joon tiles, the Teens, the Days, and the red eights. The lowest scoring pairs are the mismatched nines, eights, sevens, and fives. But even the lowest-scoring pair will beat any non-pair. When one of a player's hands is compared to one of the banker's hands, it sometimes happens that both will have the same score. For instance, a player may have a front hand worth one point, consisting of a 3-4 tile and a 2-2 tile, and the banker may have a front hand also worth one point, made up of a 5-6 tile and a 5-5 tile. In these cases, determine which tile in each hand has a higher value, as determined by the pair rankings mentioned above. In this case, the 2-2 tile is in a higher-ranking pair than the 3-4 tile, and the 5-5 tile is in a higher-ranking pair than the 5-6 tile. (Again, the rankings of the pairs follows no obvious pattern and must be memorized.) Since the 5-5 pair outranks the 2-2 pair, the banker would win this front hand. In the event of a tied point-value where the highest tile in both the player and the banker's hand is identical, the hand is called a copy, and the win goes to the banker. For example, a player may have a front hand worth 8 points, with a 4-4 tile and a 5-5 tile, and the banker may also have a front hand worth 8 points, with a 4-4 tile and a 6-4 tile. Since only the best tile in the hand is used to evaluate ties, the red eight 4-4 tile is used, and the hand is a copy. Ties are never broken by comparing the second-best tile. Similarly, the banker would win a tied hand where the banker has a 3-6 tile with a 3-4 tile, for a total of 6, against the player's 5-4 tile with a 5-2 tile, also totaling 6. Here all four tiles in both hands are identical, and the copy goes to the banker. There are two exceptions to the method described above. First, although the Gee Joon tiles form the highest-ranking pair, they are considered to have no value when evaluating ties. Second, any zero-zero tie is won by the Banker, regardless of the tiles in the hand. The key element of pai gow strategy is to present the optimal front hand and rear hand given four tiles dealt to the player. There are three ways to arrange four tiles into two hands, though practically some combinations may be the same. There are three ways to arrange these tiles into two hands. For instance, consider the four tiles at right. If tile A were made into a hand with tile B both resulting hands would score zero. However, if tile A were paired with tile C, both hands would score 5. Or if tile A were paired with tile D, the front hand would score 3 and the rear hand would score 7. The player must decide which front hand-back hand combination is most likely to beat both of the dealers' hands, or at least to break a tie in the player's favor. In some cases a player with weaker tiles may deliberately attempt to attain a push so as to avoid losing the bet outright. Many players rely on superstition or tradition to choose tile pairings.